Humax Foxsat-HDR review | What Hi-Fi? Let's just cut to the chase, shall we? This, the longest-serving Freesat PVR, remains the finest around. It's built and styled to a higher standard than any rival, delivers palpably the best picture and sound quality in this test, and it'll even stream BBC iPlayer (albeit only in beta form at present). Of course, the Humax Foxsat-HDR isn't flawless. The 320GB hard-disk is now beaten for recording capacity by some rivals, and it's also one of the pricier models around (although the 'official' price can be usefully shaved down if you shop around). In addition, there's no provision for USB file replay or media streaming over Ethernet, unlike some newer rivals (including Humax's own HD-Fox T2 Freeview HD box). But those issues aside, this is still the standard by which others should be judged. It's easy to set up and use, quiet in operation and provides useful prompts designed to ease your recording woes. Should you try to record a programme available in both SD and HD, the Humax will ask you to choose which version you prefer. And should you try to record too many channels at once, the Foxsat-HDR will cleverly inform you of repeat showings – so you can record the show you're after at another time. Finally, it includes a fascia display, which is such a benefit in day-to-day usage that we can't understand why other boxes don't fit one as a matter of course. 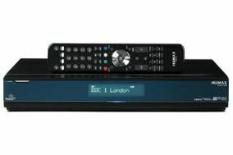 The display means, among other advantages, that the Humax becomes a useful radio tuner (for satellite radio, obviously), because you don't need to have the TV turned on to operate it. Picture and sound quality are excellent. The Foxsat-HDR's image is crisper than its rivals: not by a wide margin, but by enough to ensure that once you've seen it, you won't want to go back to the softer, less vibrant images offered by the competition. Upscaling of standard-definition pictures is good enough too, and usefully, you can bypass that feature altogether by setting the video output options to 'original'. It's an asset any AV enthusiast will value and, as an added nod to convenience, the Humax will output 5.1 over HDMI, too. As for iPlayer content, obviously it's not as crisp as satellite-delivered HD, but it is surprisingly good – and it also adds considerably to the Foxsat-HDR's appeal. It's not cheap, but in this case, you definitely get what you pay for.